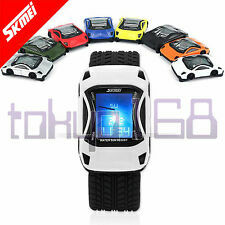 Includes alarm, stop watch and back light. PRODUCT KEY POINTS Shatter-resistant acrylic window lens. Square high-performance and durable resin case with digital display. Stopwatch function - 1/100 sec. - 24 hours. 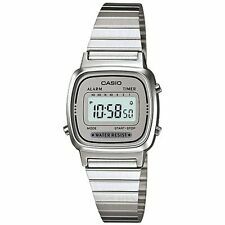 With all of the continued appearances of the casio calculator watch it's easy to see why it is an undying popular culture icon. Also Rick Moranis dons the calculator watch in "Honey I Shrunk The Kids". Casio Collection Digital LCD Watch with Stopwatch, Alarm, Light etc. Daily alarm and illuminated backlight etc. Long life battery fitted - which should be easy and cheap to replace. A simple no-nonsense digital watch: does the job and looks cool with retro-style which could be suitable for unisex use and all wrist sizes. Sport Design: Waterproof (164ft / 50M) and durable materials brings comfortable wearing. Shock resistant case is good for all outdoor activties. 12/24H Military Display. Watch Weight: 56g/ 1.97oz. Calendar with Date, Week, Month. 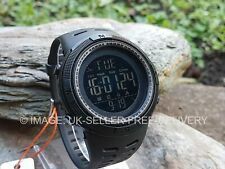 Casio Unisex Sports 100M Quartz Analogue "Neo-Display" Black Resin Watch Ref. The black resin design features a black watch face with blue colour accents. A luminous coating illuminates the watch face in the dark after only short exposure to light. 4 Multi-Function Alarms: 1. Daily Alarm; 2. Monthly Alarm; 3. Keep it original and add this watch to your collection. About This Watch Patented Hollow Core Guard Structure protects against impact and vibration. ALL BLACK MILITARY STYLE WATCH. Date,Week, El backlight, 12/24 hour. Watch strap length 29cm. CASIO F-91W ALARM CHRONOGRAPH CLASSIC DIGITAL RETRO WATCH. 4.5 out of 5 stars - CASIO F-91W ALARM CHRONOGRAPH CLASSIC DIGITAL RETRO WATCH. 144 product ratings144 product ratings - CASIO F-91W ALARM CHRONOGRAPH CLASSIC DIGITAL RETRO WATCH. CASIO F91W. 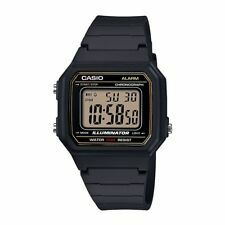 You will receive 1x Black Casio F91W Watch. You Can Do Perform CASIO Authenticity Check to Check the Authenticity of the Watch. 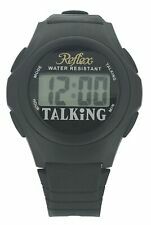 Black Strap Classic Digital Wrist Watch Unisex Design. in Black Colour. You will have a huge range of watches to choose from and a variety that is unparalleled in the market. POCKET WATCH. Special Feature: Shock Resistant. Head Depth (mm): 17. Band Length (cm): 23. Watches2U have now been in operation for over 15 years and have a wide range of different great value products. 1 X Casio Watch(Rose Gold). Original picture has been taken for proper view. 1 Year Warranty. Authenticity check. New listingMens/Ladies Designer Working Watch Joblot Collection; CASIO, D&G, KAHUNA etc. Needs strap replacing. Very good condition. Small crack on left of lcd display. Still functions. Strap loop/holder missing. You will get: 1 Wristwatch. Maximum wrist circumference: 21.5cm(8.46"),Minimum wrist circumference: 16.0cm(6.26"). Alarm clock function. Case Material: High Quality ABS Rubber & Stainless Steel Back. RRP: £110.00. You will have a huge range of watches to choose from and a variety that is unparalleled in the market. POCKET WATCH. Weight (Grams): 70. Head Depth (mm): 17. Band Length (cm): 23. Watches2U have now been in operation for over 15 years and have a wide range of different great value products. VINTAGE SEIKO/ALBA V081-6000 Z0. 100 LAP MEMO. ALARM/TIMER/CHRON. NOS!